The Vitruvian Man, drawn by Leonardo in one of his Codices (or notebooks), was chosen as the logo for Codex as it embodies the creative spirit of one of the greatest geniuses. In the five hundred years since his death, few polymaths have matched the intellect, ingenuity and artistry of Leonardo da Vinci (1452 – 1519). Although more famous for iconic paintings such as The Last Supper and the Mona Lisa, it is in his Codices, where one can really appreciate his expansive vision and unparalleled skills in bridging art, science and technology. With a passion bordering on the obsessive, he pursued studies in human anatomy, avian aerodynamics, water flows and water cycles, engineering, mathematics, geology, botany, and astronomy. He even sketched a prototype flying machine, not unlike the biplanes of the early 20th century. And in the Codex Atlanticus, he depicts a robotic ‘automaton’ knight, considered by many to be the world’s first humanoid robot. Whilst the creativity of Leonardo da Vinci was captured in his notebooks, Codex shares the wisdom of today’s great innovators via Codex Talks and events. Our mission is to inspire technology leaders and entrepreneurs to apply their collective imaginations to deliver technologies that will continue to transform our lives. The hallmark of Codex events are Codex Talks which are concise presentations, lasting 15 minutes (or less), in which the speaker addresses a challenging question faced by their technology or industry today and ends with a bold prediction for the future. Codex Talks are engaging, entertaining and elucidating. They give the audience something they can walk away with: valuable insights, actionable information, fresh perspectives, and renewed optimism. To mark the 500th anniversary of Leonardo da Vinci’s death in 2019, Codex will be organising a series of special events to instil in our children as well as ourselves the confidence and the courage to think differently…not just passively accept received knowledge but be willing to question it. 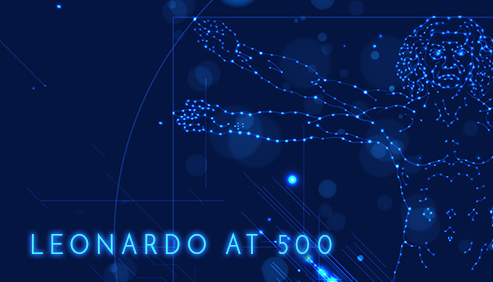 If you would like to partner with Codex with a view to embedding a ‘Leonardo at 500’ event into your 2019 plans in America, Europe or Asia, please get in touch on Tel: +44 7 956 101 101 to get the conversation started. If you would like to receive exclusive invitations to Codex events, please subscribe to our newsletter below.